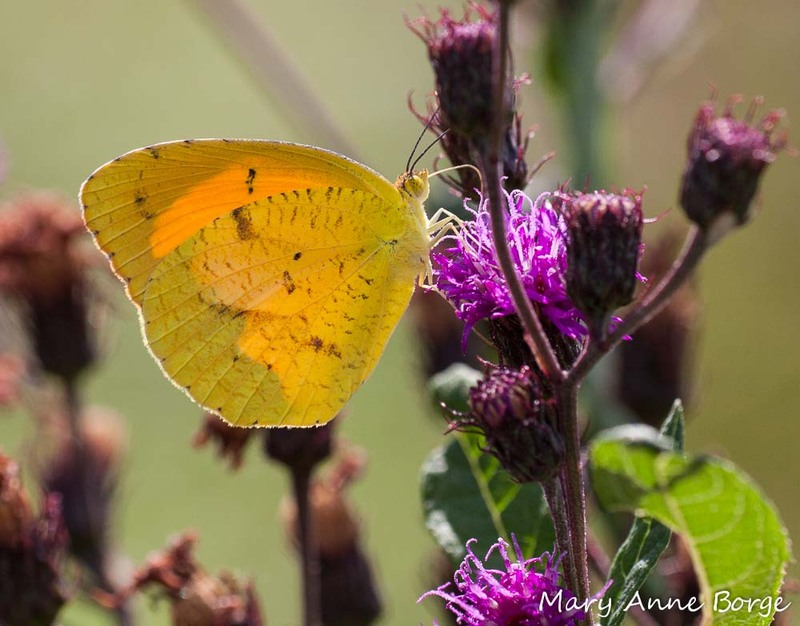 Sleepy Orange butterflies are back at Bowman’s Hill Wildflower Preserve! 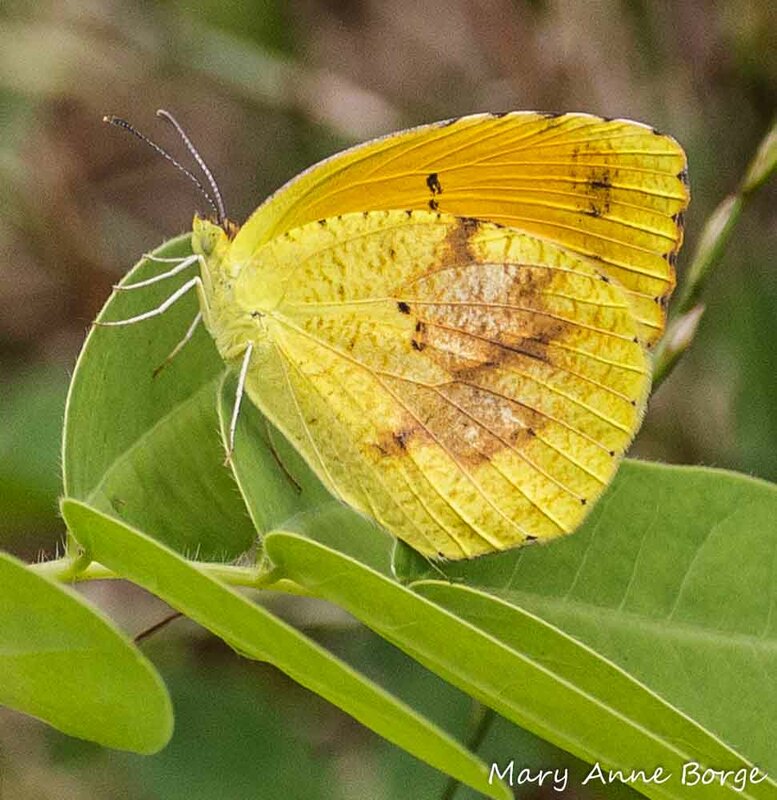 Sleepy Orange (Eurema nicippe) butterflies are a tropical species, present year-round from Central America through the southern tier of the United States. They may breed as far north as the southern tip of New Jersey, west to eastern Colorado, then dipping south to near Las Vegas, Nevada, but they are less common in the northern part of their range, and they are not thought to be able to survive the winter much farther north than North Carolina. Sleepy Orange is a species that likes to push the envelope of its territory, with individuals migrating each year to repopulate the northern areas. So it’s pretty exciting to have Sleepy Oranges at Bowman’s Hill Wildflower Preserve, because it’s considered a rare ‘stray’ in Pennsylvania where the Preserve is located. It’s rare across the Delaware River in much of New Jersey, too. In 2012, ours was the only count circle in Pennsylvania or New Jersey to report Sleepy Oranges in the July 4th North American Butterfly Association Butterfly Count. Even better, I have seen Sleepy Oranges at Bowman’s Hill Wildflower Preserve in 2006, 2008, and every year from 2010 through 2013, usually from July through September. Yesterday I counted 10 individuals. What brings them to the Preserve? 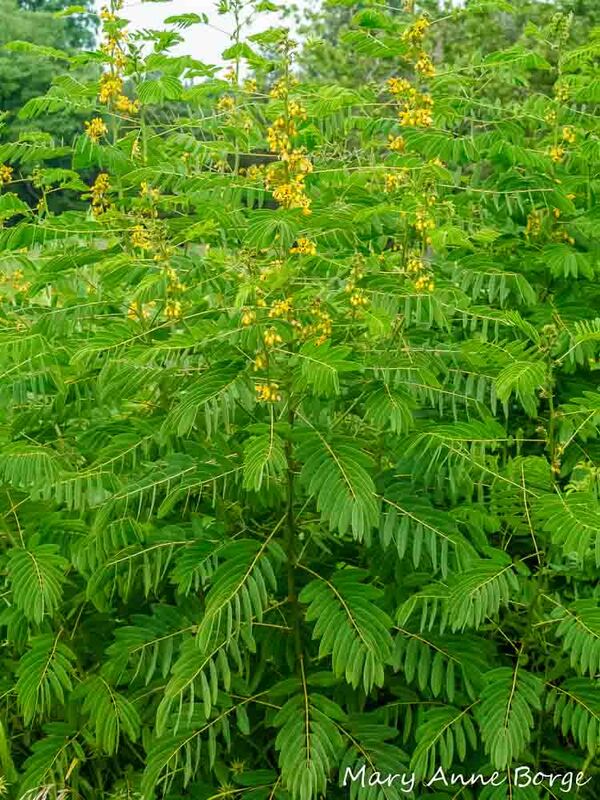 Likely it’s the reliable presence of one of their favored caterpillar food plants, Wild Senna (Senna hebecarpa). Only the presence of this food source has made it possible for Sleepy Oranges to breed at the Preserve. 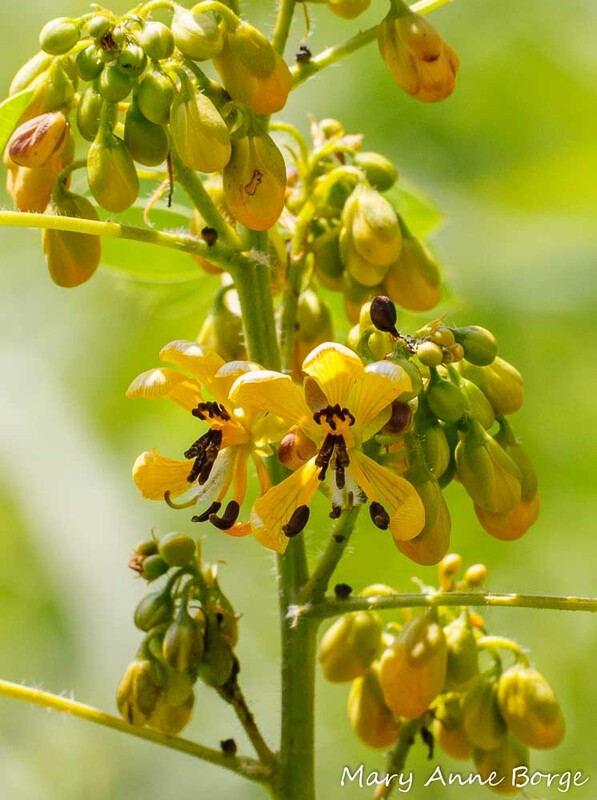 Sleepy Oranges also use other plants in this genus, and Partridge Pea (Chamaecrista fasciculata) and Wild Sensitive Plant (Chamaecrista nictitans) as food plants for their caterpillars. These plants are all pea family members, and contain alkaloids, chemicals that may have a bitter taste to some predators. Sennas also contain another chemical that has laxative properties. It is probable that Sleepy Oranges evolved to specialize on these plants because the chemicals they obtain from this diet offers some protection against predators. There are also plenty of nectar sources at the Preserve for the adult Sleepy Oranges, who are pretty eclectic in their tastes. 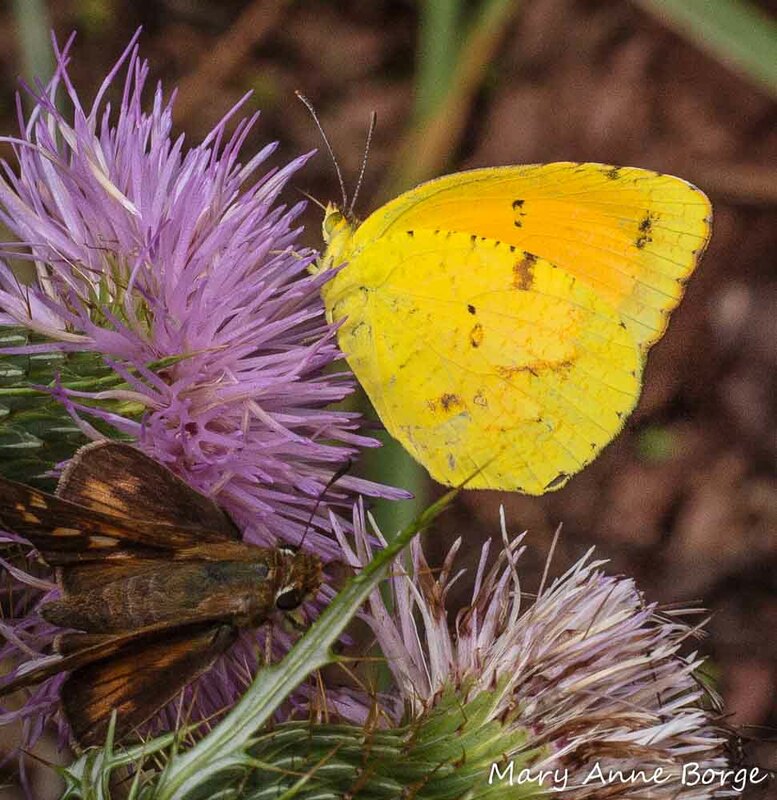 Males are also known to dine on minerals, although I usually see them drinking nectar. 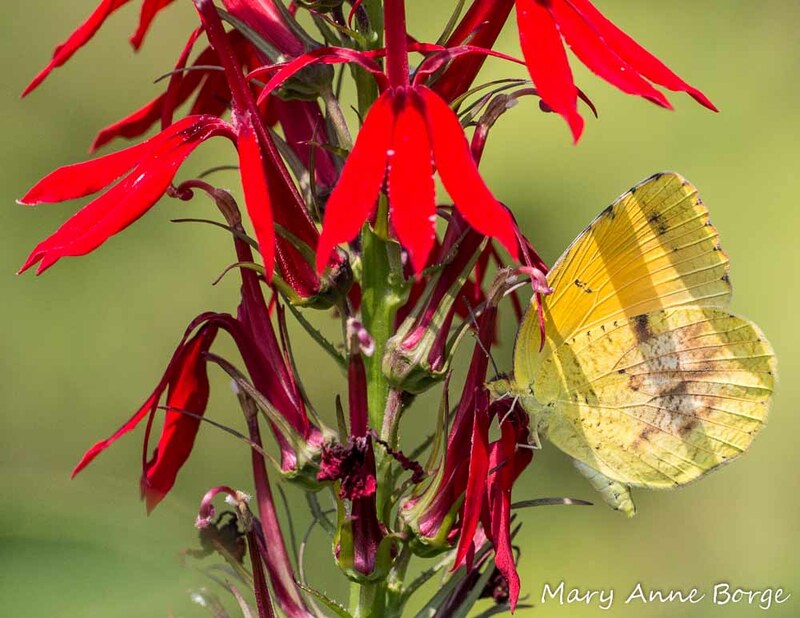 Wondering about this butterfly’s name? 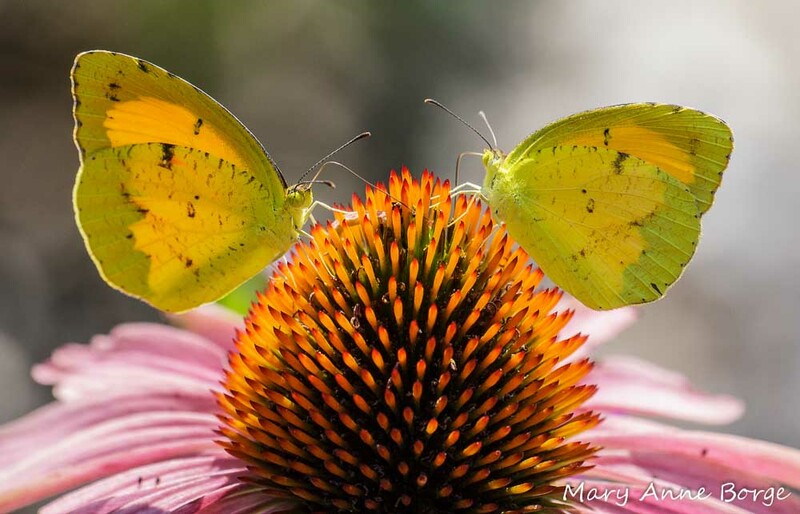 It’s not based on behavior, because this sprightly butterfly is very active. The photo below illustrates the characteristics that explain the origin of the name ‘Sleepy Orange’. The curved pattern of dark dots near the center of the upper edge of the forewing are thought to resemble a closed eye, resulting in ‘sleepy’, and the bright orange color, especially coming from the top (dorsal) side of the wing explains the rest. Sleepy Oranges overwinter as adults in the south; their winter color form is a darker red-orange. 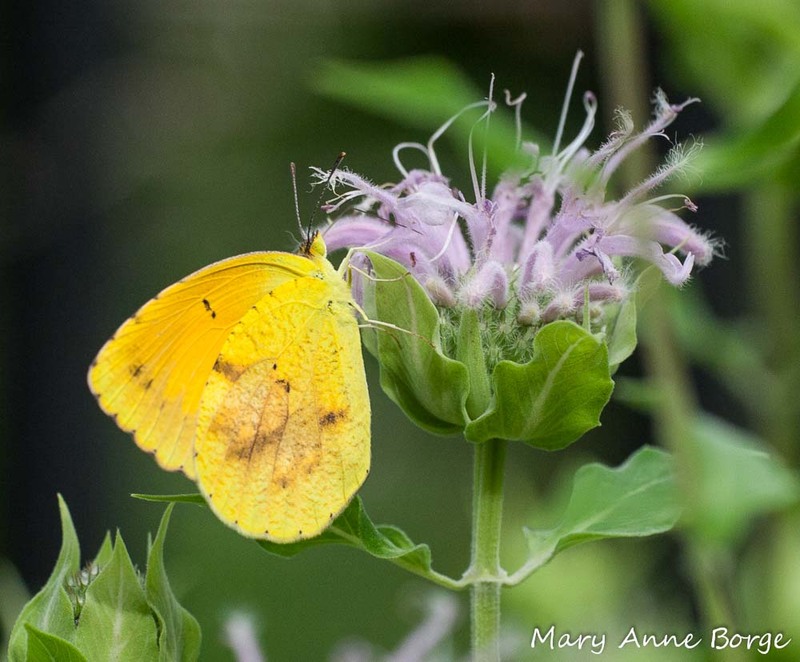 Given the rarity of this butterfly species in the surrounding area, I can’t help but wonder how Sleepy Oranges have been consistently finding Bowman’s Hill Wildflower Preserve for the past several years. It seems unlikely that this primarily tropical species would be able to survive the winter here, but with warmer winter temperatures, who knows? 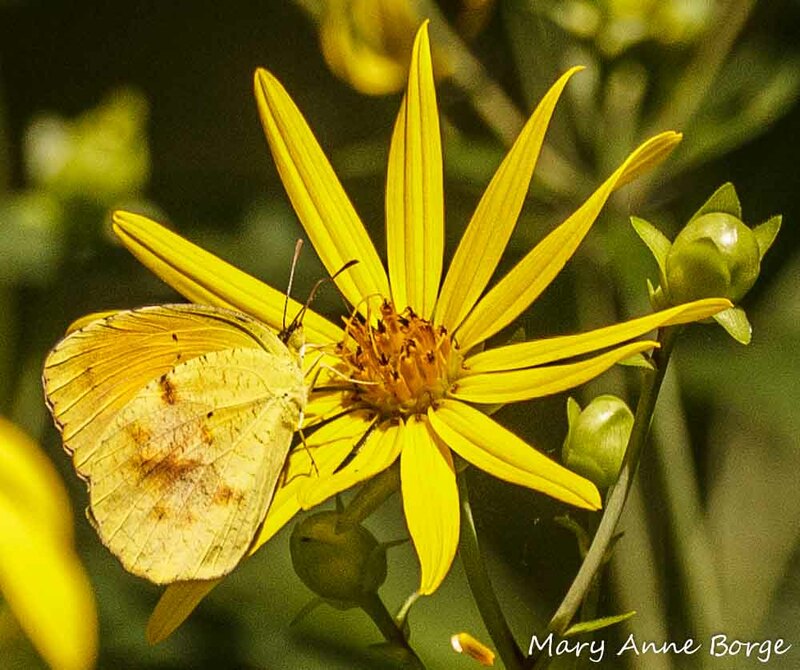 There are some reports of a southern migration of these butterflies in the fall. 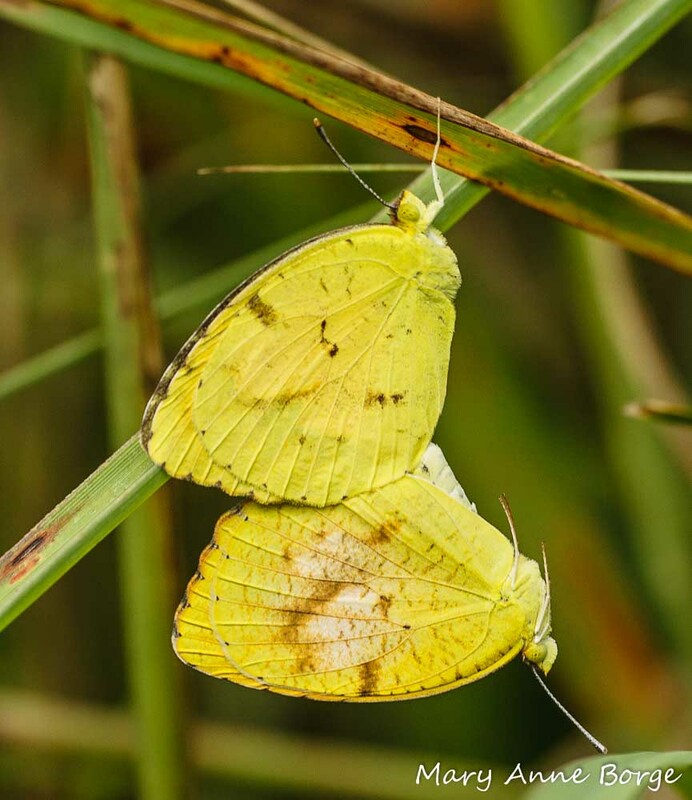 Could some of the Preserve’s butterflies have flown far enough south to successfully overwinter, and genetically pass on the knowledge of this location to their offspring? Does the generation that overwinters as adults live long enough to make a return northward migration the following year? Is this location near the Delaware River just a favored migration route for Sleepy Oranges and once they see the food available here they decide to stay? Random chance? If you have an explanation or theory for their consistent appearance here, I would love to hear it! For more on Sleepy Oranges at Bowman’s Hill Wildflower Preserve, click Sleepy Oranges Overwintering in Pennsylvania. Brock, Jim P.; Kauffman, Ken. Kaufman Field Guide to Butterflies of North America. 2003. Glassberg, Jeffrey. A Swift Guide to Butterflies of North America. 2012. 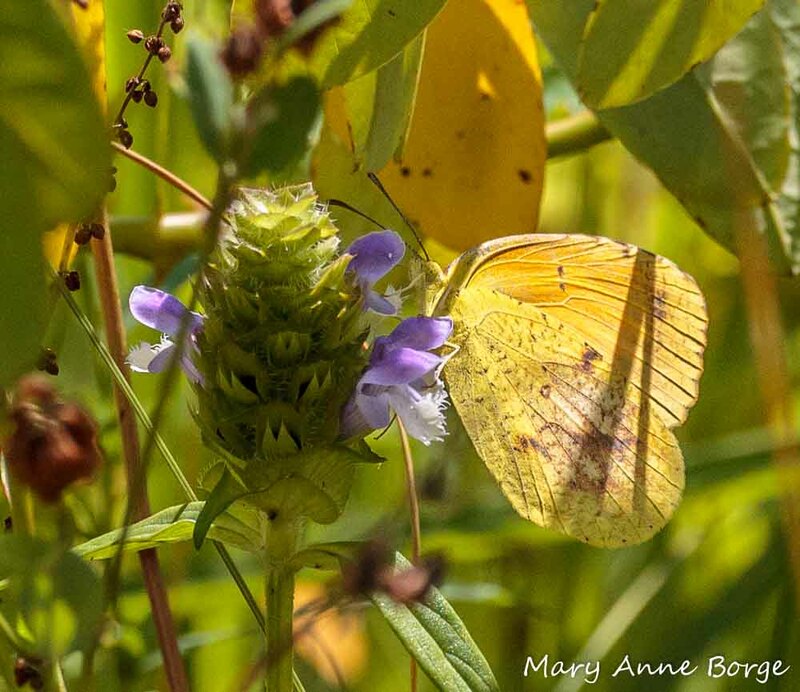 This entry was posted in Butterflies, Native Plants and tagged Bowman’s Hill Wildflower Preserve, Butterfly, Butterfly migration, Caterpillar food plant, Eurema nicippe, Host plant, nature, Senna hebecarpa, Sleepy Orange, Wild Senna by Mary Anne Borge. Bookmark the permalink. Thank you! If you would like to be automatically notified of new posts, use the ‘Follow’ or ‘Notify me..’ option. Thank you for your post that helped me identify a ‘Sleepy Orange’ nectaring on a Frog Fruit flower, here in the Southern part of Palm Beach County, Florida on August 8, 2018. I’m glad you found it helpful. It’s always fun to learn something new! Pretty neat! They’re pushing their limits. They do sometimes migrate north in late summer. Let me know if you begin to see them regularly. Good to know they’re being seen in other places. Thanks, Warren! I should have asked – have you seen them at that location in other years? I have been studying and enjoying these great photos and look forward to testing my “recall” at Bowman’s meadow. As I said to you the other day, you blog reads as if you were here talking to me! Thanks, Elaine! I’m really glad you were able to join us for the butterfly count. Your help was invaluable. Excellent pictures, as always. Interesting hypotheses about the Sleepy Orange continuing to return to Bowman’s Hill. I’m hoping that someone can come up with an explanation! Thanks, Jean. I would love to know more about how these little beauties find their way back each year! If I learn anything, I’ll let you know.